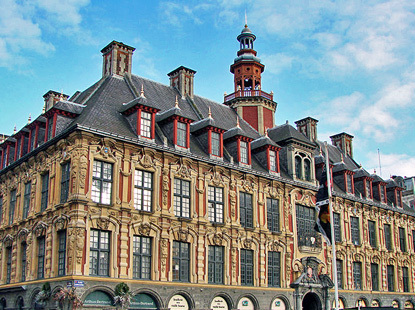 Lille (Rijsel in Dutch; population 227,000, or 1.73 million with metropolitan area) is France's 2nd largest metropolitan area (consisting of Lille, Roubaix, Tourcoing, Villeneuve d'Ascq, as well as the Belgian towns of Courtai and Tournai) after Paris. It is the capital of the Nord-Pas de Calais region, the second most densily populated region of continental France after the Île-de-France (Parisian region). The city name comes from the Latin insula or isla, which later changed into modern French l'île (or der ijsel in Dutch), which means "the island", because it was originally founded on an island on the River Deule. 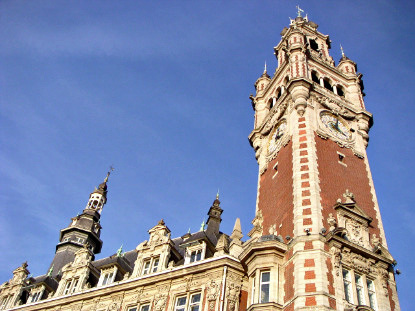 Geographically and historically, Lille is located in Flanders (French Flanders, that is). 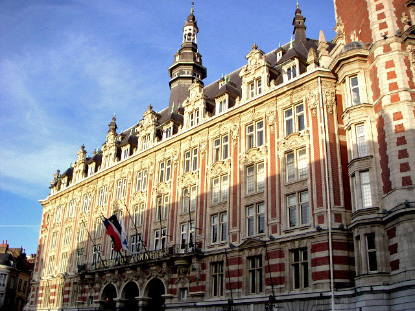 The region therefore has strong historical and cultural connections with Belgium, as the architectural style, traditional crafts, cuisine and dialects (Flemish and Picard). 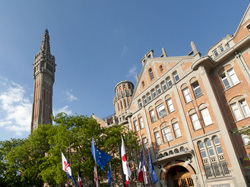 The University of Lille is the third largest in France (after Paris and Toulouse) in terms of student population (144,000 students). According to the legend, Lille was founded on the River Deûle (Deule in Dutch) in 640 as a town of the Merovingian kingdom of the Franks. It doesn't appear in written medieval charters until 1054. Trading with other towns of the County of Flanders, the town became a prosperous textile centre, along with Ypres, Bruges and Ghent. At the onset of the 14th century, the King of France, Philip IV the Fair (1268-1314), engages in open hostilities with his insubordinate vassal Guy de Dampierre (1226-1305), Count of Flanders and Namur. The Flemish first defeated the royal French armies near Courtai on 11 July 1302, at the epic Battle of the Golden Spurs (the date has been made the official "national" day of Flanders). However, Philip came back 2 years later, and the resulting Battle of Mons-en-Pévèle inflicted heavy casualties on both sides, with no clear winner. Guy de Dampierre's son, Robert de Béthune, was captured and forced to sign the Treaty of Athis-sur-Orge (23 June 1305), which recognized the independence of Flanders at the cost of the cities of Lille, Douai and Béthune, which were transferred to France. In 1477, Lille passes to the Habsburg family, and is thus united again with the County of Flanders as part of the Southern Netherlands. After the rule of Charles V of Habsburg (Charles Quint in French), the territories of Northern France and most of modern Belgium are inherited by Charles' son, Philip II of Spain, and thus become known as the Spanish Netherlands. Under Louis XIV of France (1638-1715), the French took back the Western half of the Spanish Netherlands, including the Lille region. From the official incorporation in 1668, d’Artagnan, the famous musketeers immortalised in Alexandre Dumas' novel The Three Musketeers, is appointed governor of Lille. In 1804 Lille was made county seat of the Nord départment. In 1846, a railway line connecting Paris and Lille was built. The city quickly became a major industrial centre for metallurgy, coal and textiles, prompting a population boom. All these industries collapsed after WWII, forcing the city to change its economy. In 1983, the VAL, the world's first automated rapid transit underground network, was opened. In 1993, a high-speed TGV train line was opened, connecting Paris with Lille in one hour. In 1994, the opening of the Channel Tunnel gave Lille a new lease of life, thanks to its strategic location at the crossroads of Paris, London and Brussels. Started in 1991 and completed in 1994, the business district Euralille marked the success of the city's renewal. Jean Perrin (1870-1942), Nobel Prize in physics and creator of the French CNRS (National Center for Scientific Research). Charles de Gaulle (1890-1970), general, resistance fighter, President of France (1940-46, 1958-69). Bernard Arnault (1949-), businessman, main shareholder and CEO of LVMH and Christian Dior, and 7th richest person in the world in 2006. Nicolas Hulot (1955-), journalist, ecologist and writer, founder of the TV programme Ushuaïa Nature, and initiator of the Pacte écologique for the 2007 presidential elections. 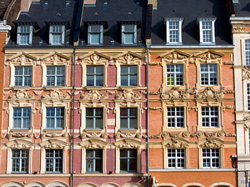 Lille is undeniably one of the most charming cities in France. Its sumptuous Flemish Renaissance architecture rival the splendours of Brussels and Antwerp's market squares, though in more colourful. 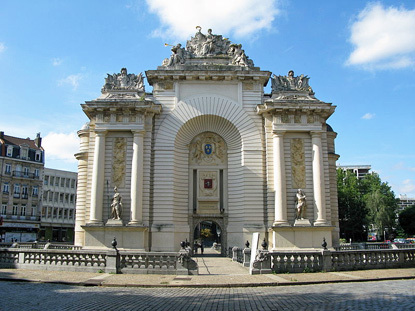 Lille's Old Stock Exchange, built in 1652-53 in the Flemish Renaissance style. A terrace of 14 three-storey Flemish Renaissance houses from the 17th-century. A neo-Renaissance edifice dating from 1910-1921, with its 76-metre belfry. A theater-style neo-classical opera house, built from 1907 to 1913. The three surviving 17th-century city gates. The most impressive is the neoclassical Paris Gate. The others are Roubaix Gate and Ghent Gate. 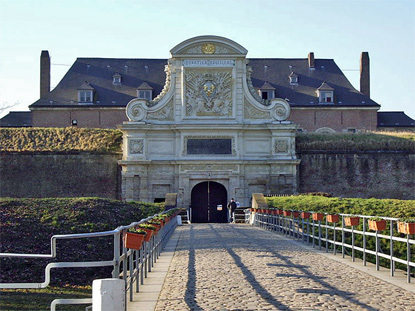 A pentagon-shaped citadel built by Vauban between 1667 and 1670, and dubbed the "Queen of the citadels" by Vauban himself. Lille's town hall. Erected between 1924 and 1932, it blends Neo-Renaissance and Art Deco styles. 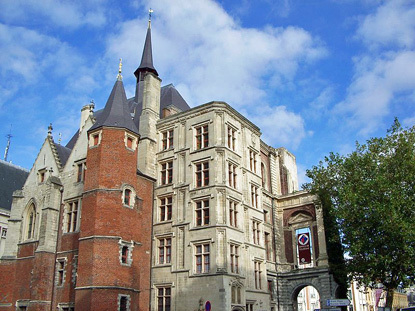 15th-century palace of the Dukes of Burgundy. It was built by Philip the Good in 1453. Originally the Basilica of Notre Dame de la Treille, it was elevated to the rank of cathedral in 1913. 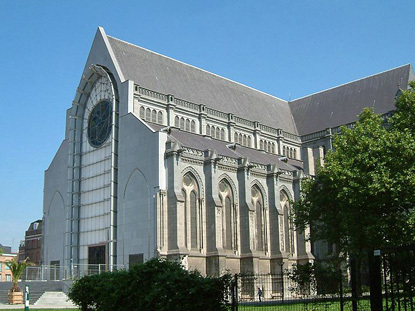 Its construction in the Neo-Gothic style started in 1854 and was only completed in 1999. Lille is an excellent city to spend an afternoon shopping. The pedestrian streets in the historical centre have an wider array of boutiques than any other city in the Nord-Pas-de-Calais region - even Belgians come here ! The brand new and pleasant Euralille shopping centre, conveniently located in between Lille-Europe and Lille-Flandres train stations, has the advantage of being opened until late (Monday to Friday until 10pm, or 8pm for boutiques) and being covered for rainy days. It has over 130 shops, including a Carrefour hypermarket. 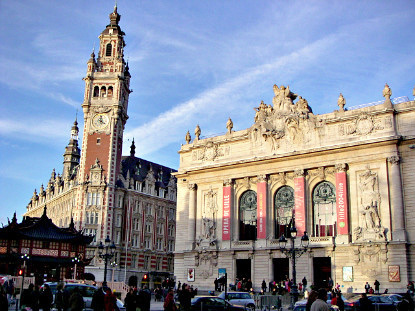 Lille is situated at the northern extremity of France, just opposite the Belgian border. 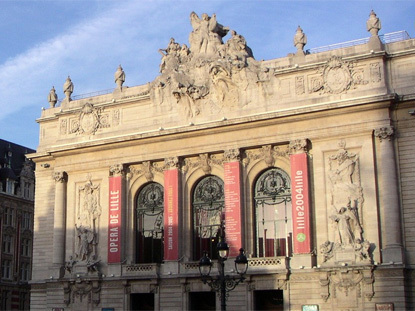 Lille has frequent (hourly or bi-hourly) TGV connection to Paris (1hour, 51.30 € ), as well as Eurostar connections to Brussels (35min, from 24.60 €) and London (1h45min, from 202.50 €). Destinations in the North of France are best reached by regular train : Valenciennes (35 to 50min, 7.80 €), Arras (45min, 9.20 €), Dunkerke (1h10min, 12.40 €), Amiens (1h20min, 17.50 €). Direct regular trains to Belgium include Brussels (from 1h15min to 2h), Bruges (1h20min), Kortrijk (30min), and Tournai (25min).